Aromatase inhibitors (AIs) are a class of drugs used in the treatment of breast cancer in postmenopausal women and gynecomastia in men. They may also be used off-label to reduce estrogen conversion when using external testosterone. They may also be used for chemoprevention in high risk women. Anastrozole, a nonsteroidal aromatase inhibitor and a widely used drug in the treatment of breast cancer. Aromatase is the enzyme that catalyzes a key aromatization step in the synthesis of estrogen. It converts the enone ring of androgen precursors such as testosterone, to a phenol, completing the synthesis of estrogen. As breast and ovarian cancers require estrogen to grow, AIs are taken to either block the production of estrogen or block the action of estrogen on receptors. In contrast to premenopausal women, in whom most of the estrogen is produced in the ovaries, in postmenopausal women estrogen is mainly produced in peripheral tissues of the body. Because some breast cancers respond to estrogen, lowering estrogen production at the site of the cancer (i.e. the adipose tissue of the breast) with aromatase inhibitors has been proven to be an effective treatment for hormone-sensitive breast cancer in postmenopausal women. Aromatase inhibitors are generally not used to treat breast cancer in premenopausal women because, prior to menopause, the decrease in estrogen activates the hypothalamus and pituitary axis to increase gonadotropin secretion, which in turn stimulates the ovary to increase androgen production. The heightened gonadotropin levels also upregulate the aromatase promoter, increasing aromatase production in the setting of increased androgen substrate. This would counteract the effect of the aromatase inhibitor in premenopausal women since total estrogen increased. Ongoing areas of clinical research include optimizing adjuvant hormonal therapy in postmenopausal women with breast cancer. Although tamoxifen (a SERM) traditionally was the drug treatment of choice, but the ATAC trial showed that AI gives superior clinical results in postmenopausal women with localized estrogen receptor positive breast cancer. Trials of AIs in the adjuvant setting, when given to prevent relapse after surgery for breast cancer, show that they are associated with a better disease-free survival than tamoxifen, but few conventionally-analyzed clinicals trials have shown that AIs have an overall survival advantage compared with tamoxifen, and there is no good evidence they are better tolerated. Aromatase inhibitors such as testolactone have been approved for the treatment of gynecomastia in children and adolescents. Ovarian stimulation with the aromatase inhibitor letrozole has been proposed for ovulation induction in order to treat unexplained female infertility. In a multi-center study funded by the National Institute of Child Health and Development, ovarian stimulation with letrozole resulted in a significantly lower frequency of multiple gestation (i.e., twins or triplets) but also a lower frequency of live birth, as compared with gonadotropin but not with clomiphene. In women, side effects include an increased risk for developing osteoporosis and joint disorders such as arthritis, arthrosis, and joint pain. Men do not appear to exhibit the same adverse effects on bone health. Bisphosphonates are sometimes prescribed to prevent the osteoporosis induced by aromatase inhibitors, but also have another serious side effect, osteonecrosis of the jaw. As statins have a bone strengthening effect, combining a statin with an aromatase inhibitor could help prevent fractures and suspected cardiovascular risks, without potential of causing osteonecrosis of the jaw. The more common adverse events associated with the use of aromatase inhibitors include decreased rate of bone maturation and growth, infertility, aggressive behavior, adrenal insufficiency, kidney failure, hair loss, and liver dysfunction. Patients with liver, kidney or adrenal abnormalities are at a higher risk of developing adverse events. Often used as a cancer treatment in postmenopausal women, AIs work by blocking the conversion of androstenedione and testosterone into estrone and estradiol, respectively, which are both crucial to the growth of developing breast cancers (AIs are also effective at treating ovarian cancer, but less commonly so). In the diagram, the adrenal gland (1) releases androstenedione (3) while the ovaries (2) secrete testosterone (4). Both hormones travel to peripheral tissues or a breast cell (5), where they would be converted into estrone (8) or estradiol (9) if not for AIs (7), which prevent the enzyme CYP19A1 (also known as aromatase or estrogen synthase) (6) from catalyzing the reaction that turns androstenedione and testosterone into estrone and estradiol. 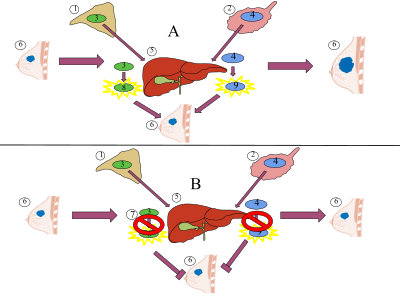 In the diagram, Part A represents the successful conversion of androstenedione and testosterone into estrone and estradiol in the liver. Part B represents the blockage of this conversion by aromatase inhibitors both in peripheral tissues and in the breast tumor itself. Aromatase inhibitors work by inhibiting the action of the enzyme aromatase, which converts androgens into estrogens by a process called aromatization. As breast tissue is stimulated by estrogens, decreasing their production is a way of suppressing recurrence of the breast tumor tissue. The main source of estrogen is the ovaries in premenopausal women, while in post-menopausal women most of the body's estrogen is produced in peripheral tissues (outside the CNS), and also a few CNS sites in various regions within the brain. Estrogen is produced and acts locally in these tissues, but any circulating estrogen, which exerts systemic estrogenic effects in men and women, is the result of estrogen escaping local metabolism and spreading to the circulatory system. Irreversible steroidal inhibitors, such as exemestane (Aromasin), forms a permanent and deactivating bond with the aromatase enzyme. Nonsteroidal inhibitors, such as the triazoles anastrozole (Arimidex) and letrozole (Femara), inhibit the synthesis of estrogen via reversible competition. Aminoglutethimide, also inhibits the enzyme P450scc and so decreases synthesis of all steroid hormones. In addition to pharmaceutical AIs, some natural elements have aromatase inhibiting effects, such as damiana leaves. Investigations and research has been undertaken to study the use of aromatase inhibitors to stimulate ovulation, and also to suppress estrogen production. Aromatase inhibitors have been shown to reverse age-related declines in testosterone, including primary hypogonadism. Extracts of certain mushrooms have been shown to inhibit aromatase when evaluated by enzyme assays, with white mushroom having shown the greatest ability to inhibit the enzyme. AIs have also been used experimentally in the treatment of adolescents with delayed puberty. Research suggests the common table mushroom has anti-aromatase properties and therefore possible anti-estrogen activity. In 2009, a case-control study of the eating habits of 2,018 women in southeast China revealed that women who consumed greater than 10 grams of fresh mushrooms or greater than 4 grams of dried mushrooms per day had an approximately 50% lower incidence of breast cancer. Chinese women who consumed mushrooms and green tea had a 90% lower incidence of breast cancer. However the study was relatively small (2,018 patients participating) and limited to Chinese women of southeast China. The extract from the herb damiana (Turnera diffusa) has been found to suppress aromatase activity, including the isolated compounds pinocembrin and acacetin. ^ Howell A, Cuzick J, Baum M, Buzdar A, Dowsett M, Forbes JF, Hoctin-Boes G, Houghton J, Locker GY, Tobias JS (2005). "Results of the ATAC (Arimidex, Tamoxifen, Alone or in Combination) trial after completion of 5 years' adjuvant treatment for breast cancer". Lancet. 365 (9453): 60–2. doi:10.1016/S0140-6736(04)17666-6. PMID 15639680. ^ Seruga B, Tannock IF (2009). "Up-front use of aromatase inhibitors as adjuvant therapy for breast cancer: the emperor has no clothes". J. Clin. Oncol. 27 (6): 840–2. CiteSeerX 10.1.1.617.8757. doi:10.1200/JCO.2008.19.5594. PMID 19139426. ^ Shulman, DI; Francis, GL; Palmert, MR; Eugster, EA; Lawson Wilkins Pediatric Endocrine Society Drug and Therapeutics Committee (April 2008). "Use of aromatase inhibitors in children and adolescents with disorders of growth and adolescent development". Pediatrics. 121 (4): e975–983. doi:10.1542/peds.2007-2081. PMID 18381525. ^ Diamond MP, Legro RS, Coutifaris R, et al. (2015). "Letrozole, Gonadotropin, or Clomiphene for Unexplained Infertility". N Engl J Med. 373 (13): 1230–1240. doi:10.1056/NEJMoa1414827. PMC 4739644. PMID 26398071. ^ Tan, RB; et al. (19 October 2015). "Clinical Use of Aromatase Inhibitors in Adult Males". Sexual Medicine Reviews. 2 (2): 79-90. doi:10.1002/smrj.23. PMID 27784593. ^ Lehrer S (2007). "Statin use to prevent aromatase inhibitor-induced fracture and cardiovascular complications". Med. Hypotheses. 68 (6): 1417. doi:10.1016/j.mehy.2006.11.022. PMID 17196764. ^ Ewer MS, Glück S (2009). "A woman's heart: the impact of adjuvant endocrine therapy on cardiovascular health". Cancer. 115 (9): 1813–26. doi:10.1002/cncr.24219. PMID 19235248. ^ Simpson, Dene; Curran, Monique P.; Perry, Caroline M. (2004-01-01). "Letrozole: a review of its use in postmenopausal women with breast cancer". Drugs. 64 (11): 1213–1230. doi:10.2165/00003495-200464110-00005. ISSN 0012-6667. PMID 15161328. ^ Rossi, A.; Iorio, A.; Scali, E.; Fortuna, M. C.; Mari, E.; Maxia, C.; Gerardi, M.; Framarino, M.; Carlesimo, M. (2013-06-01). "Aromatase inhibitors induce 'male pattern hair loss' in women?". Annals of Oncology. 24 (6): 1710–1711. doi:10.1093/annonc/mdt170. ISSN 0923-7534. PMID 23696617. ^ "Aromatase Inhibitors in Products Marketed as Dietary Supplements: Recall" (Press release). FDA. September 20, 2010. Retrieved August 9, 2012. ^ Simpson ER (2003). "Sources of estrogen and their importance". J. Steroid Biochem. Mol. Biol. 86 (3–5): 225–30. doi:10.1016/S0960-0760(03)00360-1. PMID 14623515. ^ Mokbel K (2002). "The evolving role of aromatase inhibitors in breast cancer". Int. J. Clin. Oncol. 7 (5): 279–83. doi:10.1007/s101470200040. PMID 12402060. ^ Attar E, Bulun SE (2006). "Aromatase inhibitors: the next generation of therapeutics for endometriosis?". Fertil. Steril. 85 (5): 1307–18. doi:10.1016/j.fertnstert.2005.09.064. PMID 16647373. ^ Leder BZ, Rohrer JL, Rubin SD, Gallo J, Longcope C (2004). "Effects of aromatase inhibition in elderly men with low or borderline-low serum testosterone levels". J. Clin. Endocrinol. Metab. 89 (3): 1174–80. doi:10.1210/jc.2003-031467. PMID 15001605. ^ Grube BJ, Eng ET, Kao YC, Kwon A, Chen S (2001). "White button mushroom phytochemicals inhibit aromatase activity and breast cancer cell proliferation". J. Nutr. 131 (12): 3288–93. doi:10.1093/jn/131.12.3288. PMID 11739882. ^ Chen S, Oh SR, Phung S, Hur G, Ye JJ, Kwok SL, Shrode GE, Belury M, Adams LS, Williams D (2006). "Anti-aromatase activity of phytochemicals in white button mushrooms (Agaricus bisporus)". Cancer Res. 66 (24): 12026–34. doi:10.1158/0008-5472.CAN-06-2206. PMID 17178902. ^ Hero M, Wickman S, Dunkel L (2006). "Treatment with the aromatase inhibitor letrozole during adolescence increases near-final height in boys with constitutional delay of puberty". Clin. Endocrinol. 64 (5): 510–3. doi:10.1111/j.1365-2265.2006.02499.x. PMID 16649968. ^ Chen S, Kao YC, Laughton CA (1997). "Binding characteristics of aromatase inhibitors and phytoestrogens to human aromatase". J. Steroid Biochem. Mol. Biol. 61 (3–6): 107–15. doi:10.1016/S0960-0760(97)80001-5. PMID 9365179. ^ Zhang M, Huang J, Xie X, Holman CD (March 2009). "Dietary intakes of mushrooms and green tea combine to reduce the risk of breast cancer in Chinese women". Int. J. Cancer. 124 (6): 1404–8. doi:10.1002/ijc.24047. PMID 19048616. ^ Zhao J, Dasmahapatra AK, Khan SI, Khan IA (2008). "Anti-aromatase activity of the constituents from damiana (Turnera diffusa)". Journal of Ethnopharmacology. 120 (3): 387–393. doi:10.1016/j.jep.2008.09.016. PMID 18948180. ^ Szewczyka K, Zidorn C (2014). "Ethnobotany, phytochemistry, and bioactivity of the genus Turnera (Passifloraceae) with a focus on damiana—Turnera diffusa". Journal of Ethnopharmacology. 152 (3): 424–443. doi:10.1016/j.jep.2014.01.019. PMID 24468305.